One of the most gratifying aspects of writing a food blog for eight plus years is that people think of you automatically when they want a restaurant recommendation or are traveling to a new place. Another is the friends you make in the food industry, especially if you can resist the temptation to be an overly crotchety/negative critic of the restaurants in your area. 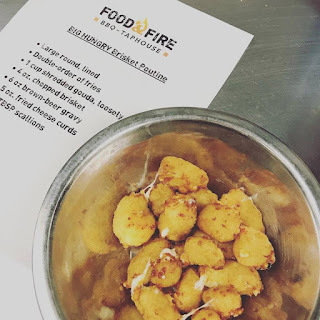 I’ve made a bunch of chef friends and restaurateur buddies through the BHS journey, and Dan at Food & Fire BBQ Taphouse in Johnson City is one of them. 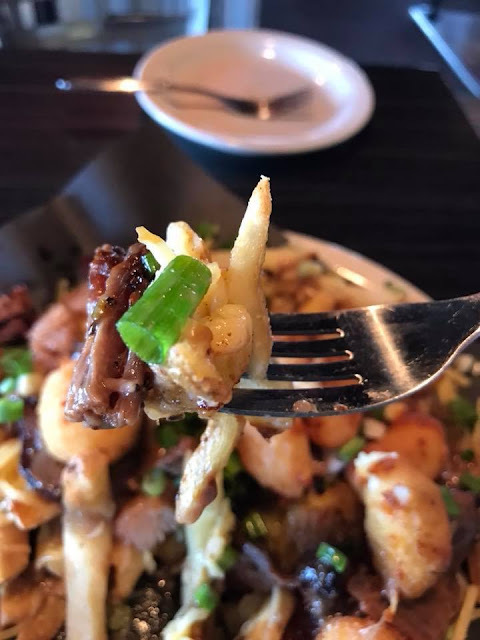 A few months ago, I had an inspiration about a burnt ends poutine, and shared it with Dan when Shawn and I were in his establishment one night, in between shoving tots into our mouths as fast as we were able. He loved the idea, and we’ve been chatting back and forth about it since then, formulating a dish that would work for his kitchen and would be optimally delicious. I’m excited to announce, it’s here. 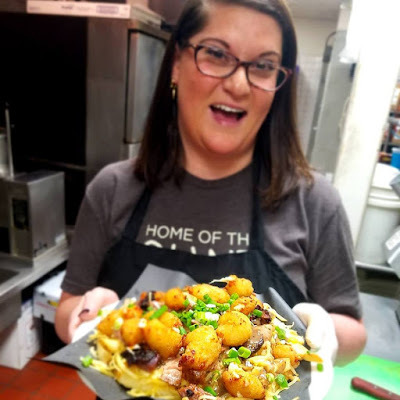 IT’S HERE, my Hungries! The burnt ends have become chopped fatty, smoked brisket, the cheese curds are fried, and I can take zero credit for the gravy, because it is Dan’s masterpiece: a beef and ale concoction that is rich and complex, so the brisket and cheese curds don’t overwhelm it. 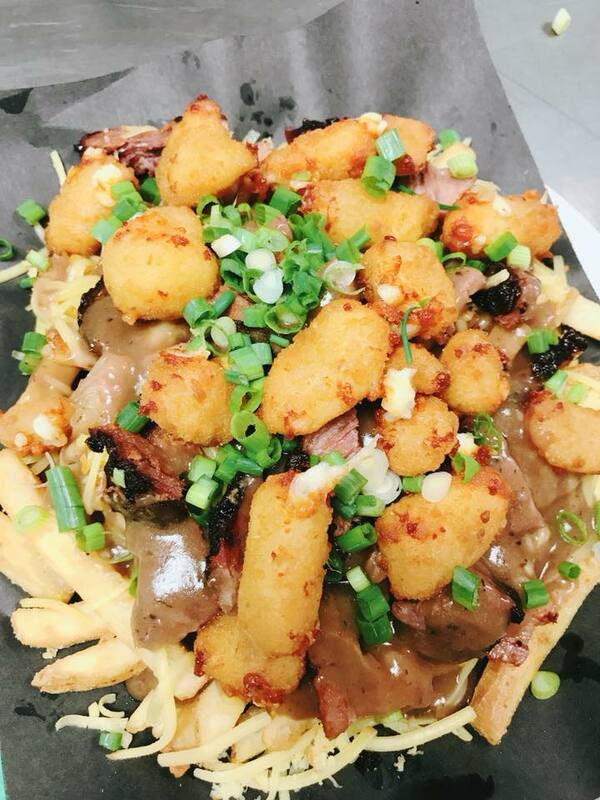 He named this magnum opus Big Hungry Brisket Poutine, because Dan is a baller, and he loves me. 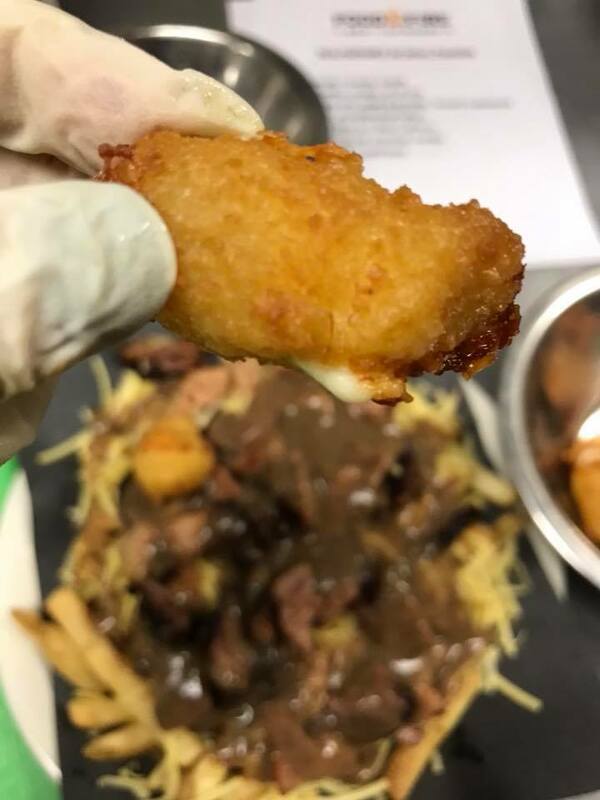 You should go in and order it when it’s on special because it is a massive platter of utter indulgence: hot, crispy French fries draped in shredded smoked gouda cheese, crowned with chunks of juicy beef brisket and studded with golden, fried cheese curds, then bathed in beer gravy and showered with scallions. It’s big enough to share with four to six of your closest friends, and the balance of this dish is the best part: it’s savory and just a bit salty, but never so rich that it finds the tipping point to too much. So let me give you a piece of advice if you like to eat really yummy things: drive to Johnson City, belly up to a table at Food and Fire, order a craft beer, and dig in to my Big Hungry Brisket Poutine. 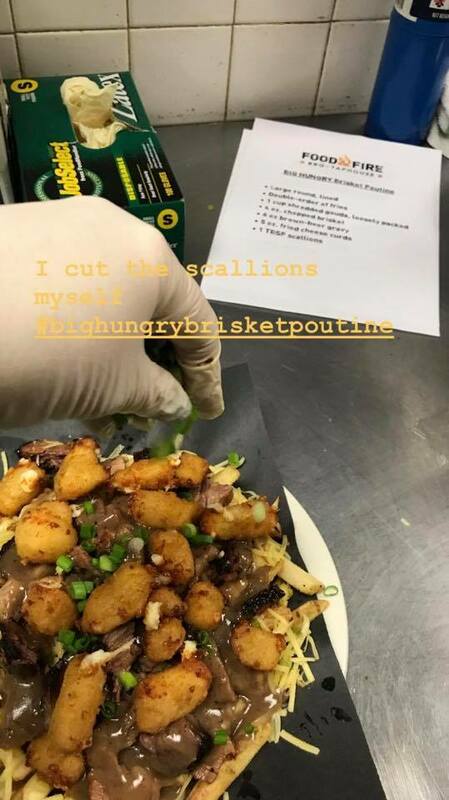 Tell Dan you love it, and maybe he’ll add it to the menu permanently! We should be so lucky. My hunger is big; my personality is bigger! I have never had poutine but have been hearing about it a lot lately! Sounds delicious!